Even the 1,200-vote lead Norm Coleman had at one point in this election might seem comfortable by now. Since the day after the Nov. 4 election, the first-term senator's margin of victory over his DFL rival Al Franken has fallen to just 206 votes. But an analysis of election returns by Minnesota Public Radio shows a change of 1,000 votes is fairly typical in Minnesota. A look at elections in the last 10 years shows that the vote totals typically change by about 1,500 votes in statewide elections in the days after the polls close. That average post-election change falls to just over a thousand if you don't count the 2002 U.S. Senate race. That election happened on separate, hand counted ballots that were handed out after the death of incumbent Paul Wellstone. Former Secretary of State Joan Growe says the adjustments fix routine mistakes. "Generally those errors occur, because some precinct didn't report in or wasn't included in the original tally," Growe said. "They transpose numbers. They made a mistake in recording it, or they forgot to record one candidate's numbers. And sometimes people are eager to get the results out unofficially, so they don't wait for all of the county to report in." Typically, those kind of errors don't matter. Other than a close Supreme Court primary this fall, the narrowest statewide election victory in the last 10 years was decided by more than 14,000 votes. The MPR analysis of the returns showed margins of victory rarely change by more than one quarter of 1 percent in the weeks following the vote. 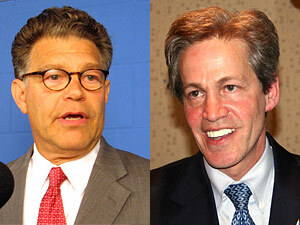 By comparison, the margin between Norm Coleman and Al Franken is now less than one-one-hundredth of 1 percent. But the analysis also showed that Democrats are usually the beneficiaries of post-election tidying up by elections officials. 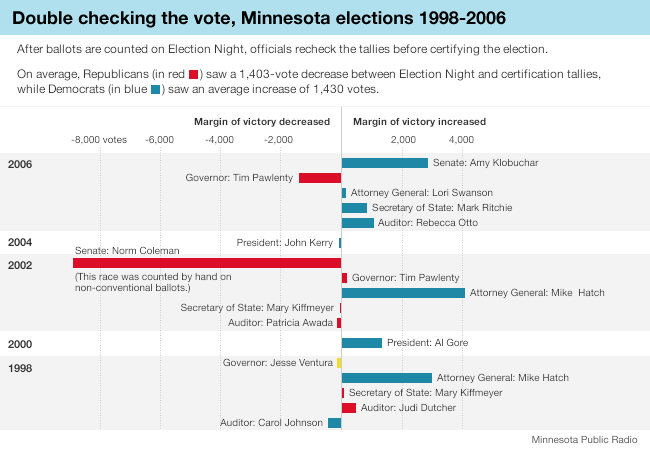 Since 1998, DFL vote totals have typically risen by almost twice as much as Republicans by the time the state canvassing boards certify a final result. It isn't clear why that's true, although the difference between the gains by the two parties has averaged less than a thousand votes per office. Statewide elections have typically had about 2.2 million votes cast.